It’s said that the only constant is change. I had a couple of big changes this week. The first change is an increase in my work hours. In anticipation of that change, I went into a sort of nesting mode — deep cleaning the house, stocking up the pantry, trying to get ahead on errands, and sewing some clothing. My other change is that I made clothing; the last time I added to my self-sewn wardrobe was in September 2016. I wanted to spruce up my office wardrobe, and what better way than by making a few custom items? Never mind that my garment sewing has been mostly limited to children’s Halloween costumes. I had enough fabric leftover from that last wardrobe addition to make a blouse or top of some sort. 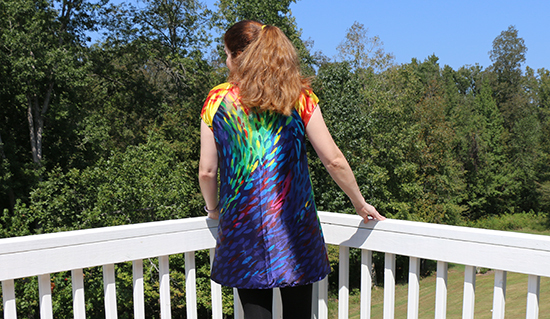 I pulled McCall’s M7093 from my small pattern collection with the tunic in View D on my mind. According to my measurements and those on the pattern, I needed a size 16 or 18. Since the version that I have only goes up to a size 14, I decided to take my chances with it. For the most part, the pattern was simple and straightforward. There are only five pattern pieces for View D, and no tricky techniques. The one quirk was that the fold lines for the center front and center back pattern pieces each have a convex curve, which is something I’ve never seen before. My first thought was to check the grainline on the pattern, but it happens to be missing from only these two pieces. After testing different angles, I decided to align the top of each piece with the fold; I thought this would keep the neckline at its intended size so the collar band would still fit correctly. As a result, the lower halves of those pattern pieces swing out wider than I believe was intended, making the tunic look more like a short dress than a long shirt. The bias-folded collar band ended up a little too long after all. It’s not enough of a difference that I noticed while sewing, but the finished collar sticks up just a bit. In this case, I think there’s a good chance that the difference is user error rather than another quirk in the pattern. The fit is good, but I need to think a bit more on how I want to pull together a full look. 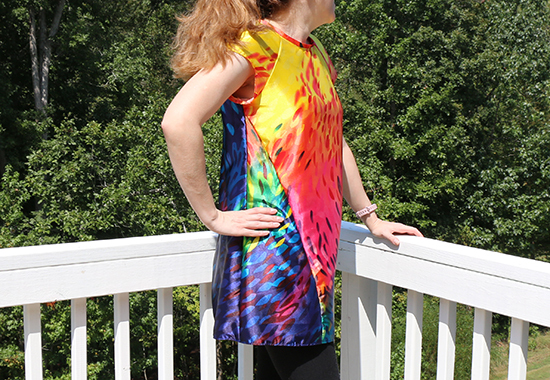 With the right styling, I might still wear this me-made tunic to work. Speaking of work, I know my increased hours will decrease the time I have for making. What I don’t know yet is how much that will impact what I have to share on this blog. But I’ll continue making as much as I can, because it’s simply what I do and that will never change. I've been in nesting mode, too, as I interview for positions and look to go back to full-time work. However. I am not quite so productive or skilled as to make my own clothing! Your tunic looks great. Thank you, Laura! I've been wanting to improve my skills in garment sewing for quite a while, so I suppose this was a last push before losing a lot of my free time. SWEET!! 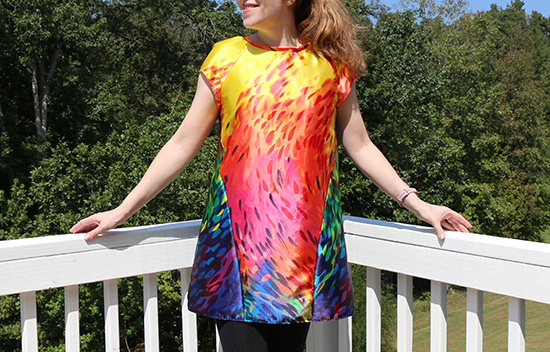 Nothing better to brighten your day than a colorful new top. Yes! I tend to pick subdued colors, but some days require a little extra. That's great fabric you chose, the tunic looks fab. Looks like the sort of think you could dress up or down too and wear a lot.